Located on the south end of the park, this world class zoo features a large variety of animals, from the tropical to arctic. With numerous exhibits geared towards all ages you may wish to spend an entire day here. 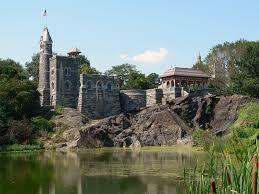 For the little ones, be sure to check out the Tisch Children's Zoo, located inside the main zoo. Free pool in the summer, and an ice-skating rink in the winter, this attraction does double duty. 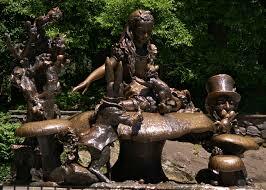 Any Alice fan will surely love this 11 foot tall bronze statue featuring favorite characters from the book. Offering a safe space for local animal residents, human visitors can tour the preserve to learn more about the wildlife and take in the beautiful scenery. The architecture of this building alone is enough of a draw but, as a bonus, there is a rotating art exhibit featured on the third floor. Make sure the kids get to stop for a photo opportunity with a true canine hero, Balto, who is forever memorialized in bronze. One of the original features of the park, be sure to check the schedule for live musical performances. Featuring grand views of the park, this structure was originally planned to serve no purpose aside from aesthetics, but now features the Henry Luce Nature Observatory. Providing views of the Central Park Lake and Bethesda Fountain, you may also be treated to a random show by one of the street performers commonly found here. For $3 your children can enjoy a ride on this popular attraction, be sure to check the hours of operation. While beautiful natural wonders abound in the park, this is the only formal garden and, along with the Conservatory Water (for model boat enthusiasts), it offers a tranquil experience. Every half-hour the clock comes alive as music plays and bronze animals dance around the base of the clock. One of the most famous lawns in the world, this huge, green swath offers an opportunity to relax with a picnic or catch some rays. Hosting a variety of nature programs geared towards children, there is also the opportunity for hands-on learning with a catch and release fishing program in the Harlem Meer, an eleven acre body of water surrounded by beautiful scenery. If your visit coincides with the season, late October to early April, be sure to lace up your ice skates and take a glide. A must see, offering boat rentals and gondola rides, it also features a full service restaurant. Not a garden at all, but actually an amusement park, it offers 12 rides for varying ages. 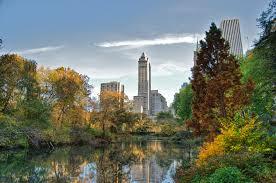 While attractions abound at Central Park, simply walking through the park will provide a vast array of beautiful trees, bridges, ponds and wildlife so be sure to leave plenty of time for your next visit.